The Flood Panel and Post System is a proprietary system designed by Flood Panel LLC. The system consists of solid removable panel flood barriers, same as the standard Flood Panel™ system, but this system does not require 45 degree support braces. 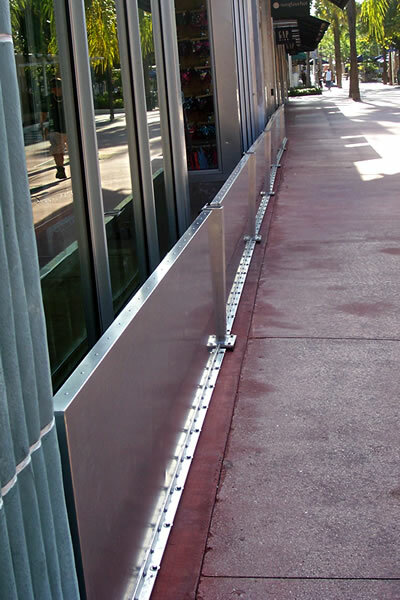 The barriers are mounted on removable vertical posts, which eliminates the need for extra support. This system was designed to accommodate issues where the flood barrier needs to be installed close to the property line and is not allowed to extend beyond that line into the public sidewalks. This issue is very common in cities with storefronts. This system can be custom designed to suit more or less any wall configuration or site-specific condition. Irregular wall angles surrounding opening. An opening requiring a full height barrier. Typical Flood Panel Panel-and-Post installation designed to protect a storefront. Please click image to enlarge. 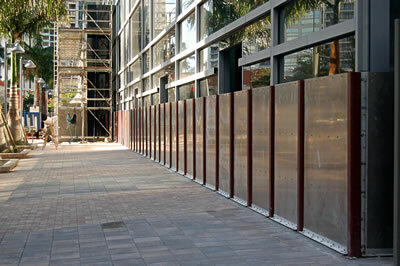 Flood Panel Panel-and-Post installation at 1450 Brickell Avenue, Miami, Florida. Please click image to enlarge.